As first reported at scotchwhisky.com; Bruichladdich has honoured its promise to release information about the casks that make up the recipe to its NAS whisky, The Classic Laddie, on its website. 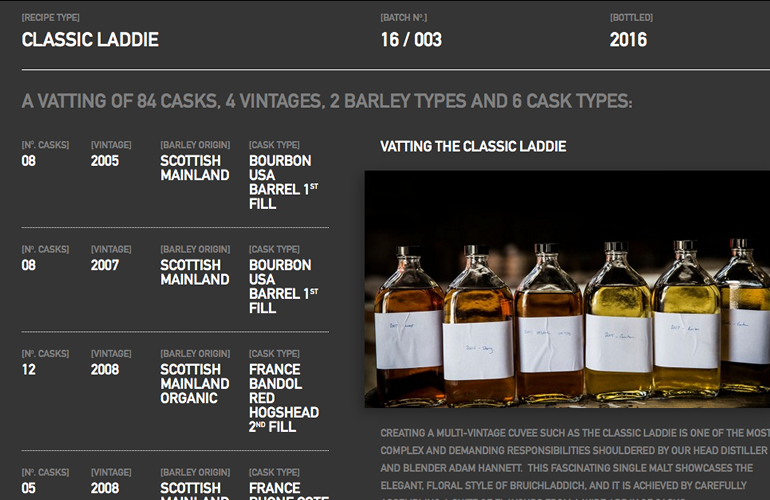 The Bruichladdich website now contains the ability to lookup the details of the casks that went into the vatting for the bottles of The Classic Laddie. 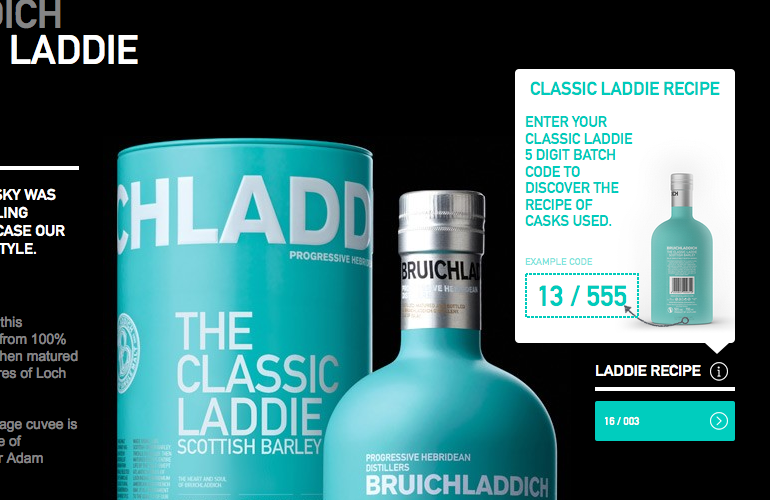 The batch code, which is printed on the back of all Classic Laddie bottles, can be entered into a field on the web page for The Classic Laddie on Bruichladdich’s website. Entering the code adds a table to the bottom of the page that lists the number of casks that were included in the vatting as well as the number of casks, vintage, cask type, and the origin of the barley from each cask series that is in the vatting. During its pledge of support for the transparency campaign that was started by the whisky blending company Compass Box, Bruichladdich announced that it would release information about the casks that went into its Classic Laddie bottles. This pledge caused a bit of consternation in some whisky circles, with the Scotch Whisky Association indicating that it was dubious as to the legality of doing so in regards to both British and European law – which prohibit the release of information regarding the age of a component whisky for anything other than the youngest component. Bruichladdich has answered such queries with the fact that the recipes are not freely available, but rather require the batch number of a bottle to find the information. I don’t know about other people (although given the number of people who have signed Compass Box’s campaign roll – I doubt I’m alone), but I find the information that the Classic Laddie’s recipes provides extremely interesting: knowing the makeup of the whisky, especially a NAS bottling, though not limited to NAS whiskies, makes me more interested in the whisky – I was actually quite surprised by the number of casks in the Classic Laddie that were ex-wine casks. Although the Classic Laddie is predominantly matured in ex-Bourbon barrels, batch 16/003 contains whisky from 32 former French wine barrels (a mixture of Bandol, Rhone Cote Rotie, Rivesaltes, Bordeaux Pauillac, and Burgundy hogsheads), and contains whisky distilled between 2005 and 2008. Unfortunately not all Classic Laddie batches have their recipes listed, with only the last 37 batches (labelled with “The Classic Laddie Scottish Barley”, not “Scottish Barley The Classic Laddie” or “Laddie Classic”) and all future batches available. If we’re lucky this sharing of information by Bruichladdich is just the start – it would be extremely interesting to be able to read the recipes of Bruichladdich’s other whiskies, including the ones with age statements. I’m a massive fan of nearly all of the modern Bruichladdich’s product range – Octomore, Port Charlotte, and Bruichladdich Islay Barley releases. Being able to read exactly went into a bottle of say Octomore 6.2, or Port Charlotte An Turas Mor for example, really would make my day. Being able to compare the differences between similarly finished releases of Octomore whilst simultaneously being able to lookup the differences in casks used in the vattings would be a spectacular opportunity – and one that I hope Bruichladdich allows us eventually. Screen capture of part of a Classic Laddie recipe.